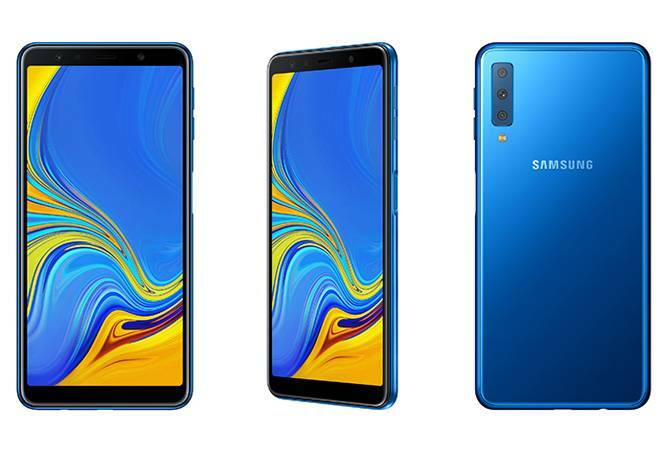 Samsung has launched the base version of Galaxy A7 with 4GB of RAM and 64GB of internal storage, whereas the higher variant comes with 6GB RAM and 128GB internal storage. Samsung Galaxy A7, which was launched in India on Tuesday, will be available for its first sale online on Thursday. The mid-range smartphone is the first device with a rear triple camera setup by the Korean tech giant. In India, the device will be available in two memory configurations via Flipkart as well as major offline retailers. Online sales will begin from 2:00 pm tomorrow. Samsung has launched the base version of Galaxy A7 with 4GB of RAM and 64GB of internal storage, whereas the higher variant comes with 6GB RAM and 128GB internal storage. The colour options for Samsung Galaxy A7 are black, blue and gold. The base model has been priced at Rs 25,660, whereas the top variant comes with a price tag of Rs 30,600. For the inaugural sale, Flipkart is offering a flat discount of Rs 1,610 on all three variants, which means that the base 4GB/64GB variant will be sold at Rs 23,990, and the fully-loaded 6GB/128GB variant will be available at Rs 28,990. Buyers using HDFC cards can avail additional cashback of Rs 2,000. No Cost EMI options will begin from Rs 2,666 per month. The triple camera setup on the Samsung Galaxy A7 2018 features a 24MP primary sensor with f/1.7 aperture and auto focus, an 8MP sensor under 120-degree ultra wide lens, and a 5MP sensor for capturing depth information. The rear camera on the Galaxy A7 comes with a Live Focus feature which allows users to adjust the bokeh effect. The 24MP sensor on Samsung Galaxy A7 automatically combines four pixels to form a bigger one, allowing for better quality images in low-light conditions. The triple camera setup on the Galaxy A7 has been equipped with Scene Optimizer, which categorises the subject and adjusts the colour, contrast and brightness to optimise image quality. The screen on the Samsung Galaxy A7 is a 6.0-inch Super AMOLED Infinity Display with FullHD+ resolution (1080x2220 pixels). For audio output, Samsung has employed Dolby Atmos in the Galaxy A7. The fingerprint sensor has been placed at the side and the back comes with a premium glass design. The insides of the Galaxy A7 feature an Exynos 7885 chipset clocked at 2.2GHz, coupled with 4GB or 6GB of RAM and 64GB or 128GB of internal storage. The 4GB/64GB variant will support memory expansion up to 512GB via microSD. Connectivity options include Wi-Fi 802.11 a/b/g/n/ac, VHT80, Bluetooth 5.0, NFC (optional) and GPS. The Galaxy A7 will run Android 8.0 out of the box and support Bixby, Samsung Pay and Samsung Health.